a couple of weekends ago, we met for our monthly women's circle/ craft night - one of our 'members', jenna, is soon due to have her first baby (eeeep!) coupled with the celebration of another member, heather's birthday, AND a special visit from our recent Ontario transplant, ami! i dont think there has ever been a better excuse for this perfect cake! I wanted to fancy this other wise simple cake up a bit, so when i opened my cupboard and found lavender that i had bought on our last trip to fredericton, i knew i had my, perfect spring-like addition! Spread batter evenly in cake pan, then rap pan on counter several times to eliminate air bubbles. (I like to drop mine a few times from two inches up, making a great big noisy fuss.) 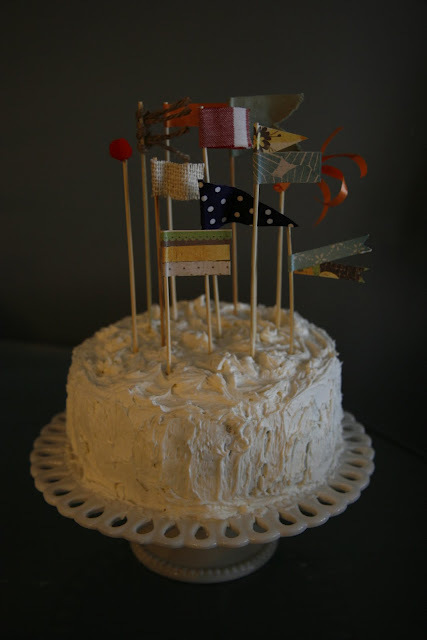 Bake until golden and a wooden pick inserted in center of cake comes out clean, 35 to 40 minutes. Cool in pan on a rack 10 minutes, then run a knife around edge of pan. Invert onto rack and discard parchment, then cool completely, about 1 hour. * With a single 9-inch cake pan, I baked the cake for a little over 55 minutes. Place ½ cup milk into a small saucepan with lavender and bring to a boil. Remove from heat once bubbling. Cover the pan and let it sit for 15 minutes so that the lavender infuses with the milk. Pour lavender milk into a cup and place in the refrigerator for a further 30 minutes to cool. 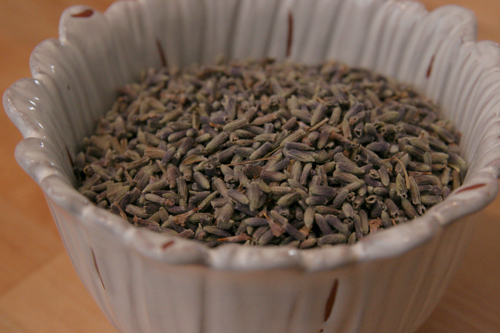 Remove milk from refrigerator and strain to remove lavender buds. Set milk aside. Beat butter and sugar together until light and airy and fluffy (around 10 minutes). Add HALF of the lavender milk and mix to combine. Taste frosting; add more lavender milk if needed (i did not).